Background: Nasal tip amputation is a rare but difficult problem to manage. Nonmicrovascular nasal tip replantation is a valid and relatively simple repair option for moderate nasal defects, but tissue ischemia and graft failure occur frequently. 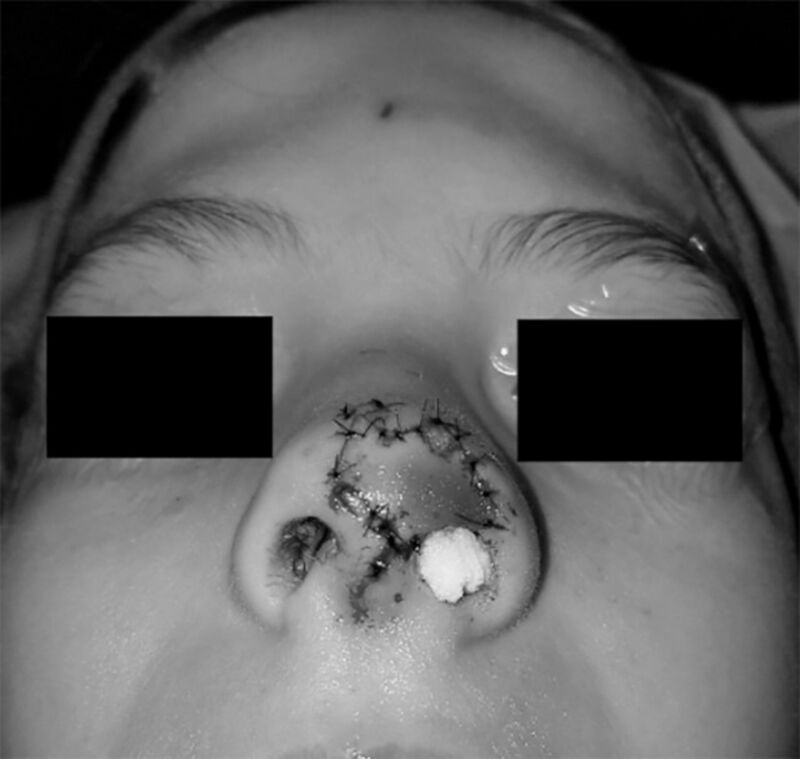 Case Report: We present the case of a pediatric nasal tip amputation from a dog bite treated with replantation within 5 hours. The 2.5-cm avulsed tip contained skin, cartilage, and mucosa and was replanted as a 3-layer composite graft. Hyperbaric oxygen (HBO) therapy was initiated for 2 weeks postoperatively. The outcome was functionally adequate, and the majority of the native nasal tissue was salvaged. Conclusion: HBO therapy can be used after nonmicrovascular nasal tip replantation to improve graft survival and potentially decrease the need for revision surgery. Hyperbaric oxygen (HBO) therapy has proven to be beneficial for graft or flap salvage in cases compromised by decreased perfusion or hypoxia.5 Several animal studies have demonstrated improved composite graft survival with the use of HBO therapy.6-9 Two case reports demonstrate the use of HBO therapy after free tissue replantation on the nasal tip.5,10 We present a case of pediatric nasal tip amputation successfully managed by immediate replantation with postoperative HBO therapy. An 8-year-old male presented to Ochsner Clinic Foundation via ambulance after sustaining a nasal tip amputation from a dog bite. The amputated tip was located, placed in a plastic bag, and transported on ice. Physical examination at presentation revealed a 2.5 × 2.2-cm defect of the left nasal tip. 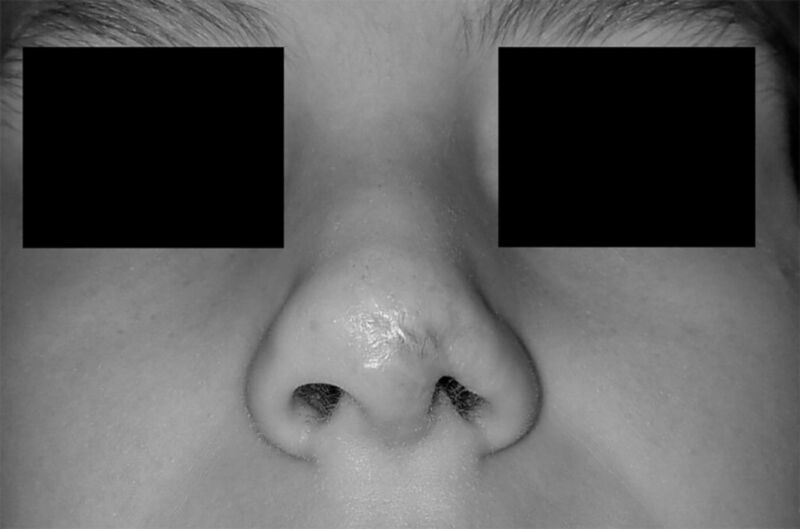 The defect involved the nasal tip with a portion of the left lower lateral cartilage, the soft tissue triangle, a portion of the left alar rim, and the anterior one-third of the columella (Figures 1A and 1B). No identifiable venous or arterial vessels were in the amputated tissue or nasal defect. In the operating room, the defect was copiously irrigated with normal saline, and debridement of the wound was performed with an antimicrobial solution and gauze. The amputated tissue was removed from the ice bath and placed in Betadine Solution for sterilization. The lower lateral cartilage was approximated with 5-0 MONOCRYL sutures (Ethicon) in simple, interrupted fashion. The skin was approximated in layers, first using deep dermal 5-0 MONOCRYL sutures. Then the superficial layer was closed using 6-0 nylon sutures in a simple, interrupted fashion. The nasal mucosa in the vestibule was approximated to the graft using 5-0 chromic sutures in simple, interrupted fashion (Figure 2). Tissue ischemia time was approximately 5 hours. Moderate ecchymosis was noted on the lateral portion of the graft, but significant engorgement was not appreciated; thus, leech therapy or induction of external bleeding was not considered. The patient was discharged with amoxicillin/clavulanic acid (Augmentin), and HBO therapy was initiated within 72 hours. He was treated in a multiplace chamber. He underwent 2 treatments on day 1, followed by daily treatments for 2 weeks. He was closely followed in the clinic. The graft experienced mild epidermolysis at postoperative day 10 (Figure 3), but the foundation of the graft remained viable. The patient is currently 6 months from the date of replantation and has remained functionally asymptomatic (Figure 4). No further surgery has been performed, but he may require a minor revision procedure in the future as growth may lead to worsening alar notching or tip asymmetry. The one reported case of nonmicrovascular pediatric nasal tip replantation by Nichter et al from 1991 demonstrated successful nasal tip reattachment with adjuvant use of HBO therapy.10 In 2000, Rapley et al reported successful use of HBO therapy for auricular composite grafting in a pediatric nasal tip amputation.5 Our case combines both nonmicrovascular replantation and postoperative HBO therapy for a pediatric patient. Many case reports document the successful use of microvascular reconstruction for repair of nasal tip defects.3,4 Microvascular reconstruction may be considered for large tissue defects, long ischemia time, and defects with identifiable vessels.1,4 However, successful nasal tip microvascular reconstruction requires a skilled microvascular surgeon and extensive operating room time.2 In many cases of nasal tip amputation, microvascular reconstruction may not be a feasible option; therefore, we present this case to highlight an alternative treatment plan that may offer successful functional and cosmetic results. Our case involved a multilayered defect affecting multiple subunits of the nose. The amputated tissue sustained minimal crush injury and was kept on ice, with an ischemia time of approximately 5 hours. We demonstrated successful replantation of a multilayered free-tissue composite graft in a notoriously problematic area of the nose in a pediatric patient. We feel that in this case, HBO therapy enhanced the graft survivability and eliminated the need for a major revision procedure. Nasal tip amputation is a rare encounter; however, surgical repair often results in suboptimal outcomes. Replantation offers improved outcomes compared to local flaps, but partial graft loss requiring revision surgery is common. Microvascular repair of a nasal tip amputation requires a highly trained microvascular surgeon because of the caliber of potential vessels to anastomose. In our experience, nonmicrovascular nasal tip replantation of a 2.5-cm, 3-layer graft followed by 2 weeks of HBO therapy resulted in a successful functional outcome with preservation of the majority of the native nasal tissue. Further studies are necessary to understand its true benefit, but we feel that HBO therapy can be used after nasal tip replantation to improve graft survival and potentially decrease the need for revision surgery. Successful non-microvascular nasal tip replantation after traumatic avulsion. Internet J Plast Surg. 2005; 2 2: 1- 6. http://ispub.com/IJPS/2/2/10912. Accessed January 18, 2017. Effects of hyperbaric oxygen on the take of composite skin grafts in rabbit ears. J Hyperb Med. 1988; 3 2: 79- 88. http://archive.rubicon-foundation.org/4367. Accessed January 23, 2017.